WEEKLY BEACH-SIDE VACATION RENTAL. Breathtaking views of the Gulf of Mexico. 4th floor unit in Covert II on the beach with fabulous Gulf views from your private over-sized lanai, living room and master bedroom. Nicely maintained and comfortably furnished living room with fully equipped kitchen. King size bed in the master bedroom and 2 twin beds in the guest bedroom. Equipped with FREE wireless Internet. Elevator access. 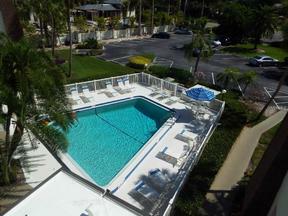 Heated pool and deeded beach access. Guests will enjoy the convenience of the Centre Shops with fine dining, breakfast and lunch cafe, bank, and UPS store. Direct full Gulf/beach front. This unique property allows a very unusual 7-day rental policy. Turnkey Furnished with large comfortable screened lanai.